Extremely fast, two days early. Excellent!! Lens in great shape, quick delivery. Always a pleasure with good sellers! Thank you for the fast shipping..
Quick shipping, item as described. Great seller! Fast Shipping. Item exactly as described. Awesome seller! Product as described. Good seller! Plan on testing lens tomorrow. Came on time or sooner sign for with UPS. Did not ship! Had to cancel order. Still Canon's Best Versatile Zoom! Still Canon's best versatile zoom! Despite the less-than-glowing official reviews, this new 24-105 is a worthy purchase. I've owned the Mark I version three times, the 24-70 f/2.8 II, and the 24-70 f/4. My major disappointment with the f/2.8 II was lack of IS. Halloween and Christmas pics were next to impossible to get without toting a tripod around. The f/4 was very nice since it had IS, but I still missed that 105mm! I just recently purchased the Tamron 24-70 G2, which is a fantastic lens (f/2.8 and Vibration Compensation), but guess what...I missed that 105mm! So, decided to buy this lens, and after a little bit of AFMA, the lens is superb! Quick focusing, sharp images (much improved in corners), and lets in more light than the previous version. No, it doesn't have 2.8, but the IS is better than the first version, so that helps tremendously with slow moving subjects. You can shoot everything from wide landscapes to head and should portraits with nice bokeh. Yes, you lose some quality when compared to the 24-70s, but that is pure physics. This is the best compromise between image quality and focal range in my experience. Great Lens but Do You Need It? Pros: very good build quality, weather sealing, lens sharpness and contrast Cons: for some this lens can be seen as being heavy, but I am ok with that since most of my work involves a camera mounted on a studio stand or tripod. One note: the sharpness and contrast of this L lens may not be that much greater than some of Canon's newest non L lens to justify the price differential so if you do not need the weather seals and the extra durability, the extra cost vs. A newer non L lens may not be worth it for the bump in sharpness and contrast for some photographers. A substantial Lens. This is a heavy weight. Love the range that the zoom provides. Crisp imagery. If I had it attached to a smaller Canon model other than my EOS 1D I'd feel overwhelmed by it's size however. Great for an upper body workout though. The IS is an absolute must for this baby. This lens allows for great portrait shots especially with blurred backgrounds. It’s fast, and accurate, but a bit on the heavy side. This lens is huge compared to the kit lenses that normally come with Canon cameras. Great quality product. Good improvement from previous version. There is a noticeable optical improvement from the previous version, but most of the improvements seem to be in the build quality. 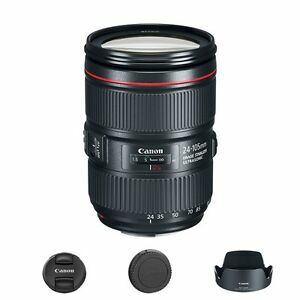 Lens has a more solid feel, focus is fast and accurate, and improved image stabilization.